Service Rank and Number / Rheng gwasanaeth a rhif: Private 290485. Ref No Grave or Memorial / Rhif cyfeirnod bedd: R.C.191. Died on Friday 8 November 1918 aged 18 years. John Bernard Rafferty was born in Holywell, Flintshire during 1900. The 1901 Census states that the family lived at 9 Blue Bell Yard, Holywell, Flintshire. The head of the family was Bernard Rafferty aged 34, who was employed as a Tin Smith. His wife Mary Rafferty (nee Holmes) and their 6 (six) children – Mary Rafferty aged 10, Edith Rafferty aged 7, Margaret Rafferty aged 5, Annie Rafferty aged 3, Ellen Rafferty aged 2 and John Bernard Rafferty aged 6 months. Little is known of his Military Service other than he joined the Pembroke Yeomanry as a Boy Soldier. 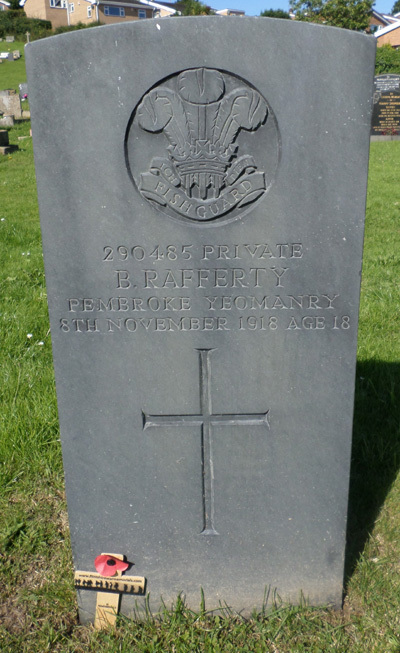 John Bernard Rafferty’s grave is at Holywell Cemetery, Fron Park Road, Holywell, Flintshire and overlooks the Dee Estuary. A photograph of the headstone was taken on Friday 7 August 2015 by Geoffrey Mitchell, who placed a British Legion wooden remembrance cross on the grave on behalf of Flintshirewarmemorials. On 25 June 1919 a payment of £3.6s.8d was made by the War Office to Mrs Mary Holmes, this being monies owed to her son Bernard. A further payment which is recorded as a War Gratuity of £6.15s.0d was also later made to her. There was no Flintshire Roll of Honour card for John Bernard Rafferty at the County Archives Office, Hawarden. Details of his medals were obtained from (www.forces-war-records.co.uk).